This photo is of my first Silver Star presentation. This is at DLI-WC (Defense Language Institute - West Coast) in Monterey, CA where I was learning German. The year was 1969. The company was in a U shaped building. Behind me is one of the U's legs. My CO is behind me with his arms crossed. The entire company was in formation in front of me. The presenter was the commanding officer of the institute. (NOTE: Although I'm wearing a "flying saucer" and not a beret, I was still SF qualified. There were 2 other Sfers in the German class with me. When we went to class, we did wear the low quarters (like a black dress shoe) and not the boots we would otherwise wear and we wore our berets. When a soldier took the various tests to see if he was suitable for SF training, the men who were more independent free thinkers were the ones that were picked. We were known to ignore orders once in awhile. In a formal presentation like this, the entire company is in formation, usually 4 platoons with 4 squads each. The awardee is in his normal position in the company formation with everyone standing at attention. The First Sargent gives the command, "Sargent Stahl. Front and center - post." The awardee takes one step backwards, a facing movement (either left or right), marches to the end of the formation, turns toward the front of the formation and at the front of the company turns toward the center. When the awardee gets to the middle of the formation, he (she) stops facing the company. All this is done in the military fashion. 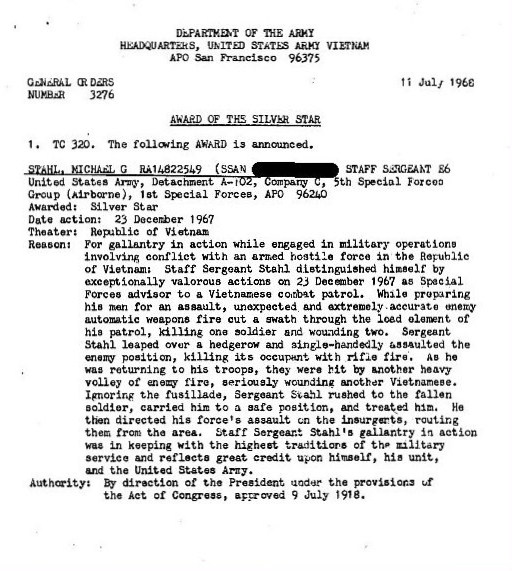 The citation or orders detailing why the medal is being given is read. The awarding officer steps in front of the awarded. Salutes are exchanged. The presenting officer pins the medal on the pocket as seen in the photo. He usually shakes the hand of the awardee and comments on the decoration. He might also see fit to address the formation, especially if the awardee is still in the company in which the award was earned. At the time of this presentation, the public had not yet turned against soldiers returning from the war. Pictures were taken and a photo with a copy of the orders was sent to the awardee's home town newspaper. When I was wounded at the end of my second tour and undergoing treatment at Walter Reed Army Medical Center about a year later, the mood of the masses had turned against us. I was told I was to be presented some baubles and when and where to report (in uniform). Walter Reed had an auditorium with a stage. About 5 or 6 of us where put on the stage. I was the ranking man, so I was at the far right facing the audience of maybe 20 or 25 board patients. No one was required to be there. I was awarded my second Silver Star, my second Bronze Star (for service), the Air Medal and a Purple Heart. The orders/citations were read as the officer pinned my new medals to my pocket. As he pinned the last medal on, I remember him comparing me to Audie Murphy (the highly decorated movie actor who fought in WWII). That was really a stretch. The awarding officer was wearing no decorations indicating he had been in Nam and was easily impressed. There was no photographer and no notice of my awards was sent to my home town newspaper. Click photo for more info. Doubleclick photo to close.